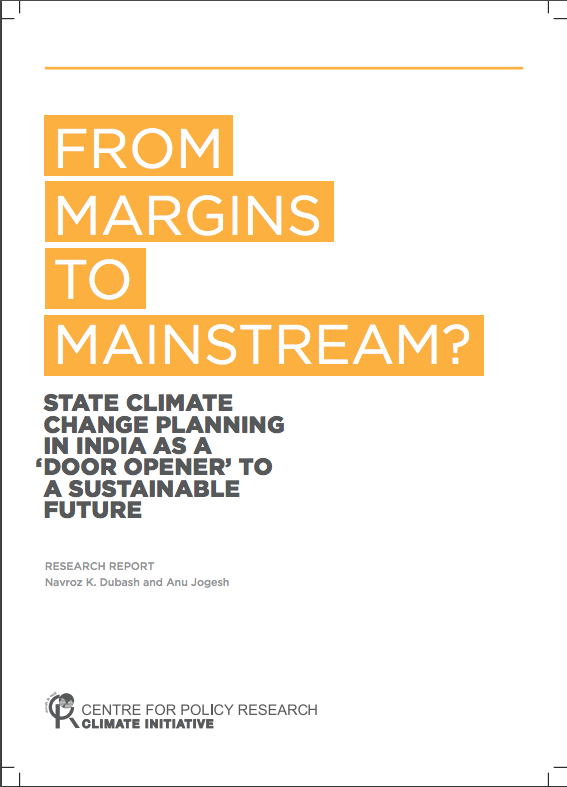 In this paper, Dubash and Jogesh analyse climate action plans for five states in India. They find that while such plans are an important institutional process to mainstream environmental sustainability into development planning, India's state action plans do not redirect development towards climate resilience. This is because of shortcomings in approach, process, formulation of outcomes, and implementation. State Action Plans on Climate Change hold potential as an important intervention in the development process. They provide an institutional platform to mainstream concerns of environmental sustainability into development planning and, if done properly, to update ideas of sustainability to include climate resilience. This platform provides a potential opening to enterprising and committed bureaucrats, but is also an opening with which development practitioners, academics, business, and civil society at large could productively engage. At the moment, this promise is not being adequately realised. As discussed in this study, there are shortcomings in approach, process, formulation of outcomes, and implementation efforts. These shortcomings are united by a common thread – a tendency to prematurely view state climate plans as vehicles for generating implementable actions rather than an opportunity to redirect development toward environmental sustainability and climate resilience. Thin conceptual frameworks, processes that provide no space for generating a vision of change, limited state capacity, and truncated time frames all reinforce this outcome. While concrete actions are indeed important, these may be of limited value unless informed by a broader vision of future directions in key climate-related sectors such as agriculture, water, and energy. State plans are viewed as the beginning of a complex process rather than as an end in themselves, they provide a foundation upon which to build. The recommendations contained in this report suggest specific measures that the central government, state governments and donor agencies could adopt. In addition, if climate plans are indeed used as an opportunity to redirect development, then they require a much more robust process of engaging civil society and business stakeholders in envisioning alternative futures on a sector by sector basis and corresponding interest and engagement from these stakeholders. The path forward requires iterating climate plans with an eye to a more robust framing, a process that enables broader dialogue within and outside government, structured outcomes at different levels of specificity, and staged implementation that prioritizes internalization of sustainability and climate resilience into sectoral departments. How Reliable are Regional Climate Models? Is adaptation to climate change gender neutral? This paper analyses the climate change plans of 5 states in India. It identifies key shortcomings that are impeding climate changes resilience building and make recommendations for improvements. Ethiopia is a country in which a lot of foreign land acquisition is occurring. This paper looks at the extent to which these investments also constitute significant acquisitions of water.